If you’re an Amazon merchant, you have a few options when it comes to fulfilling orders. But which one is right for your business? If you’re an Amazon merchant, you have a few options when it comes to fulfilling orders. You can use Fulfillment by Amazon (FBA), Fulfillment by Merchant (FBM), or Seller-Fulfilled Prime (SFP). The answer to that question depends on your business model, amount of working capital, margins, and how well you can move your inventory. In this article, we’ll go over the pros and cons of each option so you can make an informed decision about how to best sell your products on Amazon. Fulfillment By Amazon, in a nutshell, lives up to its name. If you opt for FBA, Amazon handles the picking, packing, and shipping on your behalf. The company also handles customer service and returns. In other words, FBA gives you a break from routine, day-to-day responsibilities so that you can focus on growing your business. FBA doesn’t just offer an added bit of convenience, though. It also gives sellers access to Amazon’s hyper-efficient shipping operation. Of course, Amazon doesn’t offer that service for free. That’s why you should check out the company’s fee schedule before you decide to participate. You might find that FBA is just a little too expensive. Pay particular attention to that last bullet point: Inventory management. That’s because Amazon will charge you additional fees for products that stay in its distribution centers for a long period of time. To limit your inventory management fees, you’re going to have to move products within 6 months. 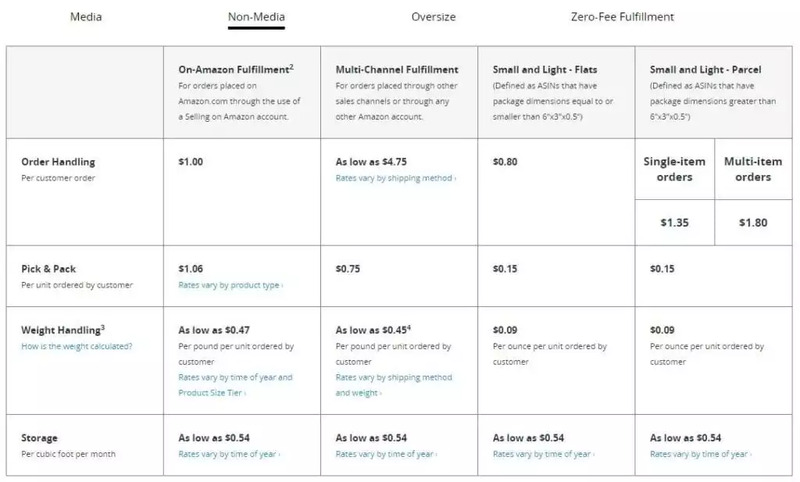 Keep in mind, too, that Amazon reserves the right to change its fees at any moment. You can be sure that, at least on some occasions, those fees will increase. If you want to take a look at how much FBA will eat into your margins, head over to the FBA Calculator and run the numbers. Then, go over the results with your accountant. Some merchants consider FBA fees the cost of doing business. They also appreciate the time they save when Amazon handles all the headaches associated with shipping, handling, and customer service. Oh, and there’s another thing merchants appreciate about FBA: access to prime customers. Amazon has around 65 million prime customers. FBA merchants can actively market to those people. That’s important for a couple of reasons. The first and most obvious reason is that merchants who can reach prime customers increase the size of their market. The second reason is that prime customers tend to spend more on Amazon, so they’re more likely to make a purchase. Perhaps one of the reasons that prime customers are willing buyers is because they have access to free two-day shipping. That’s a deal-sweetener in e-commerce. Also, Amazon claims that almost half of its customers won’t buy from sellers who don’t use FBA. So you’ll already have that strike against you if you decide to fulfill orders yourself. Finally, FBA merchants have a better chance at winning the Buy Box over other sellers. If you’re unfamiliar with the Buy Box, it’s the spot on a product detail page that allows shoppers to add the item to the shopping cart. Because multiple sellers might offer the same product, Amazon has to choose which one of them gets the sale if the visitor decides to make a purchase. The seller that Amazon picks is the winner of the Buy Box. If you opt for FBM, you’ll be responsible for shipping, handling, and customer service yourself. That can be both time-consuming and expensive. That’s not to say that there aren’t advantages to FBM, though. For starters, you won’t find yourself at the mercy of Amazon when it comes to fulfillment fees. As we’ve seen, those can add up. You can also package each item you send so that it’s perfect for the product. Don’t expect Amazon to do that for you. If you’re a seller who believes in going the extra mile when it comes to customer service, you can also include a personalized, handwritten note with each shipment. That’s a great way to build relationships with your customers. Of course, you’re going to have to store the inventory yourself. It’s likely that you’ll need a space bigger than a garage to do that. You’ll also need a dedicated customer support line. You’ll have to answer customer calls yourself or hire somebody to do it for you. Then, you’ll have to deal with the hassles associated with returns and complaints. That’s not much fun. You’ll also limit your marketing potential with FBM. That’s not only because you’ll have trouble winning the Buy Box, but also because prime customers prefer prime merchants. If neither FBA or FBM please you, there’s a third option that combines the best of both worlds: SFP. With SFP, you get access to Amazon prime members just as with FBA. However, you handle shipping, handling, and customer service yourself. The obvious benefit, of course, is that you get to avoid the high costs associated with Amazon fulfillment while still reaching the broader Amazon market. You also get more control over inventory management and how you ship your products. Keep in mind, though, that SFP isn’t for everybody. Amazon is very picky about who is allowed to participate in the program. For starters, you’ll have to follow a very strict list of requirements. You’ll also have to go through a trial period to make sure that you can keep customers happy with a minimum of 300 orders. Those rules may seem harsh, but remember that Amazon wants to give its prime customers the best service possible. Now that we’ve looked at an overview of the different fulfillment options, let’s consider the advantages and disadvantages of each alternative. Which option should you choose for your business? That depends. For starters, let’s make this easy: when in doubt, go with FBA. That’s because you’ll enjoy the benefits of outsourced operations. If you find that the cost of FBA eats too much into your margins, you can use your free time to look for ways to make it up on volume and/or increase your profits. If you’re selling products that give you a particularly high margin, then going with FBA is generally a no-brainer. It’s tough to sell products on Amazon with a high margin, though. If you’re running a small-to-medium sized business (SMB) and you don’t have any room for storage or working capital to manage customer service, then your only realistic option is FBA. Sure, it’s going to cost you some money, but part of running a successful business is learning how to generate a profit in difficult circumstances. On the other hand, if you’re running an SMB with its own warehouse and you already have shipping, handling, and customer service operations in place, you might find that FBM is the best option. That’s only the case if you don’t qualify for SFP, though. If you qualify for SFP and you have employees who can pick, pack, and ship, then you should almost certainly choose that option. As we’ve seen, SFP gives you the benefits of both FBA and FBM: access to prime customers and the flexibility of handling your own shipping. Also, don’t forget to consider the costs of inventory when weighing the different options. If you think your products are going to stay in storage for a while, then you’ll have factor in the additional storage costs associated with FBA. Obviously, you won’t have to worry about that if you’re storing products at your own location. If you’re like most Amazon sellers, then FBA is probably the way to go. However, it’s likely that the cost of selling on Amazon with FBA will increase over time. Factor that into your pricing strategy. On the other hand, if you’ve got a business that can manage inventory and employees who can handle day-to-day operations, you should make an effort to qualify for SFP and use that fulfillment option.